Just some photos here of Gilford, New Hampshire–the idyllic Gilford, a picturesque town where every building is painted white and every road leads uphill. In future postings I will show the seamy underbelly of Gilford: the dark woods and the well-worn paths to distraction that lead out of town and into the arcades, the boardwalk, and the five-minute photo booths, the bingo parlor and the beaches. . . but for now let’s wax nostalgic on the town’s quaint quaintness. . . Standing at the crossroads. 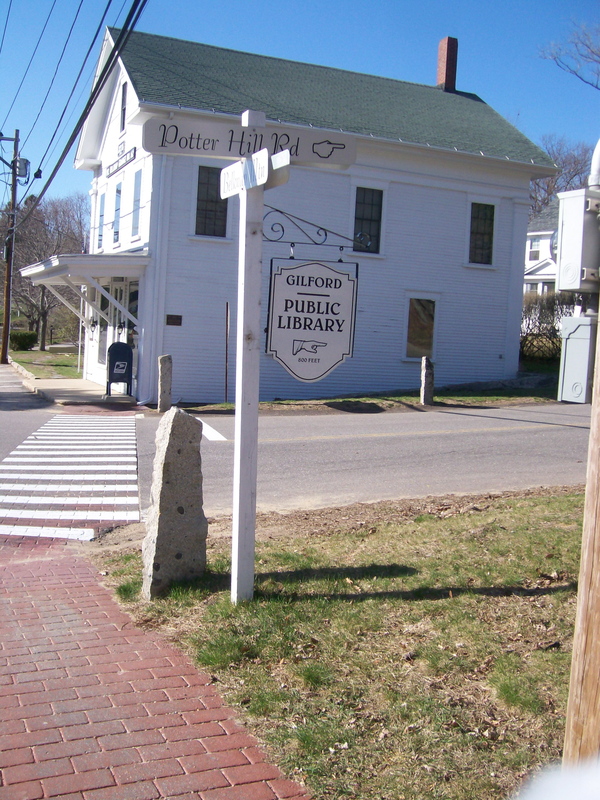 . . the Gilford Grange and the post office box, the only place to send mail in Gilford, as we had no post office. Our mail was supposed to be addressed to Laconia, New Hampshire–the nearest city with a post office–but this was an insult–we did NOT live in Laconia, we lived in Gilford. So, in the old stubborn way of Yankees, we had our mail sent to Gilford anyway, and the rural free delivery mail carriers delivered it without fail. 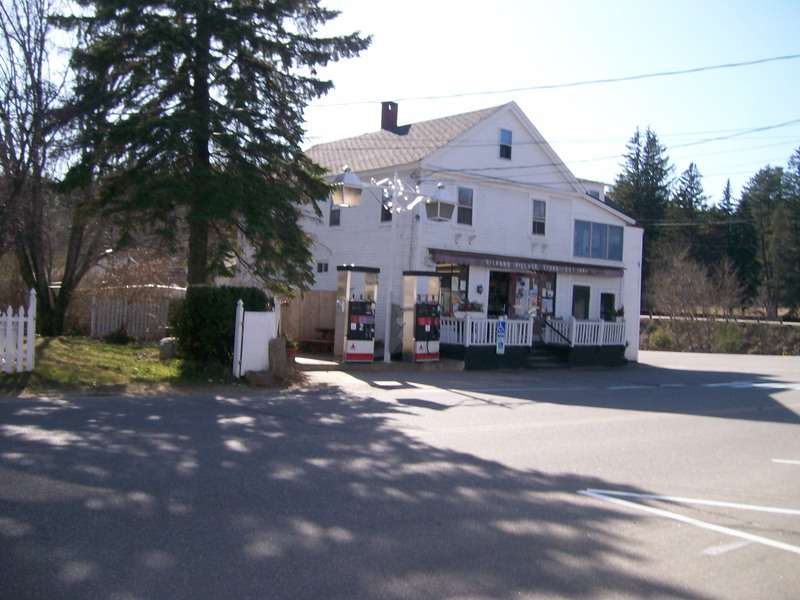 The Village Store, virtually unchanged for decades, though they no longer have the glass jar of pretzel rods (3/5 cents) or the little packages of Smarties and penny candy that emptied the change from our pockets on a regular basis. The store was conveniently located near the village field, which meant if you were stuck watching your brother’s stupid T-ball game, you could at least run over and get yourself a Taste-E-Ice (10 cents) in your favorite color, blue. 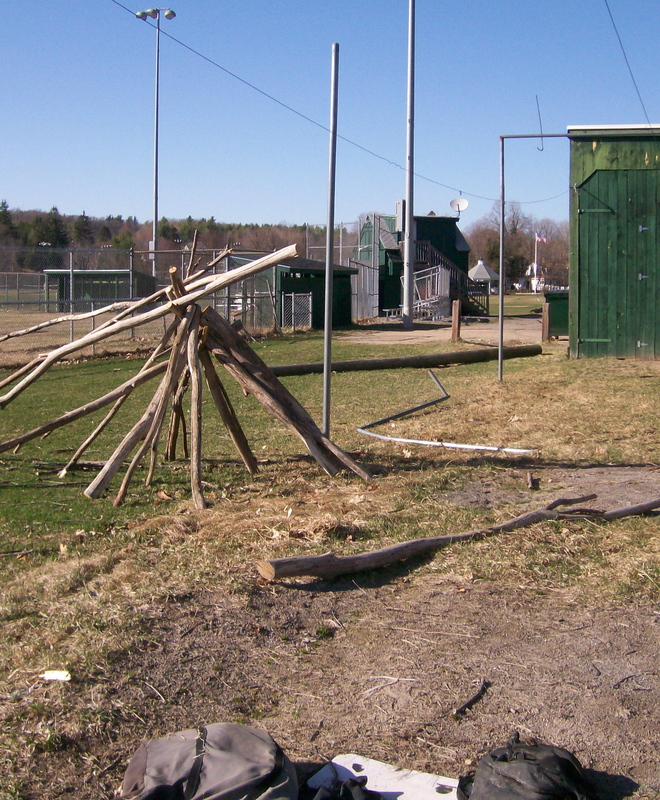 The village field. Strange sculpture in foreground, probably built at the hands of high schoolers in the wee hours of the morning who could certainly be up to worse shenanigans. The bandstand in the background was built for the bicentennial, just in time for Gilford Old Home Day. I remember the Old Home Day parade being the best that year, and not just because I got to ride on our neighborhood float (Betsy Ross sewing the American flag, and her arm really moved up and down). My dad was driving the float and when he heard someone on the side of the road say “Who is that, Martha Washington?” he shouted back “It’s Betsy Ross you idiot!” For some reason I still think that’s funny. 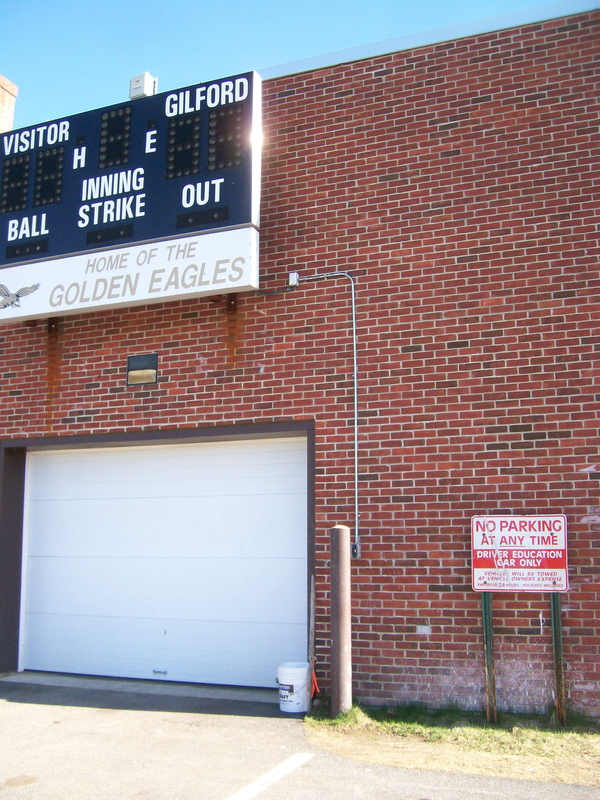 Gilford Middle High School. . . I suppose I could have taken the wide angle shot that got the whole building in, but why? It’s a school that looks like most others and what goes on inside is just as common and mundane and horrible and tragic and amazing and remarkable as what goes on in all other high schools in America. . . 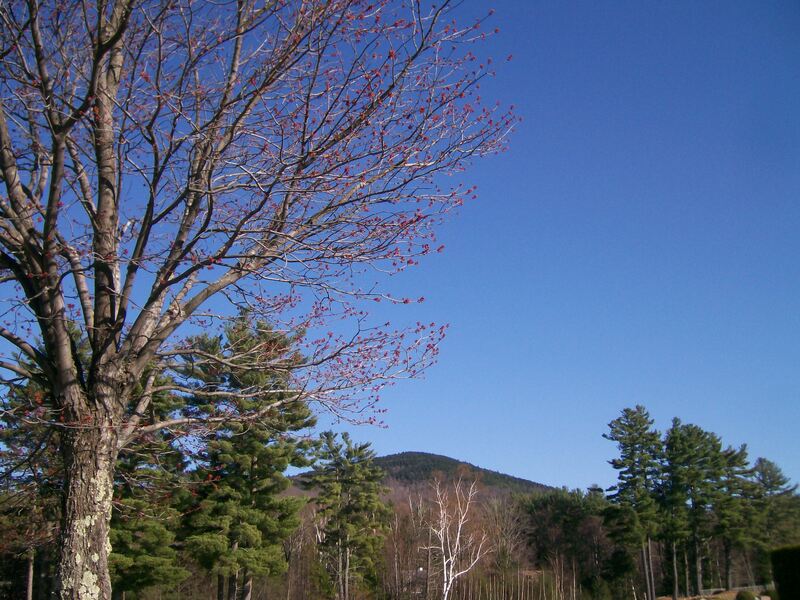 The benevolent Belknap Mountain, which looks over the elementary and middle high school and guards the Pine Grove cemetery as well. Also site of many a late night excursion by high schoolers with cars and nowhere else to go. 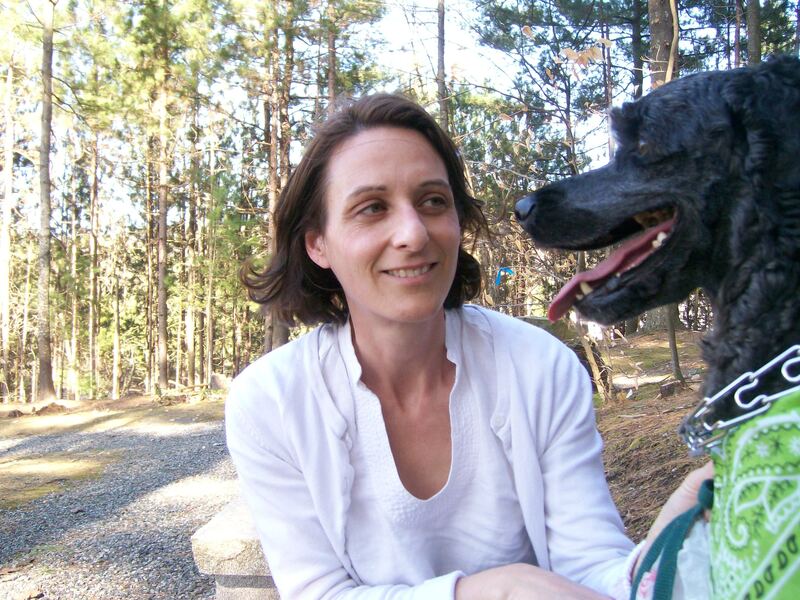 . .
Charley the dog and me at the Wixson Memorial Garden, out behind the Gilford Community Church. Nothing nostalgic here, just a lovely place to meditate on the past and future. . . which I suspect is just what Reverend Wixson would want. And here is where we end. . .
There’s no place like home, there’s no place like home. 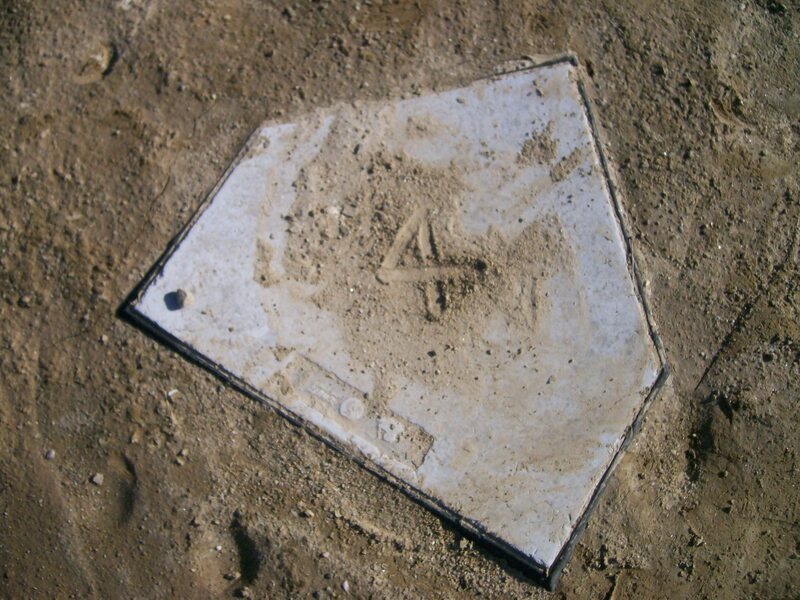 . . (just stop when you get to four). Man you found my heart there Katie! That’s what Gilford is to me…still my home even though I haven’t lived there since 1991. Can’t wait to see the dark side. Funny. You might be part of that dark side. . . watch out! I do plan to write about that Modern English concert you and Mark and I went to–remember we were in the front row? Oh yeah, there was only one row. . . I’ve never felt so sorry for a band before.